Happy New Year! I know it’s not a great time to be thinking of house maintenance…at least not until the champagne stops bubbling! The new year is a fresh starting point and is a great time to get a few home maintenance items checked off that ever growing “honey do” list! CHIM CHIM— Chimney fires are easy to prevent with a little maintenance, so before you light those fires, be sure to check your chimney for buildup (or better yet, have it professionally cleaned). PLANT 911— Bring any warm-weather (aka easily killed) plants indoors or to the garage so they have half a chance to survive the winter. Add mulch to your flower beds to create a warm layer for the plants. It’s also a good idea to have a few blankets or towels ready for your most delicate plants, in case we have some deep or extended freezing weather. FILTER CHANGE— This is a 2 minute fix! Yes! Change out your HVAC air filter. It will help your system run more efficiently and save you some money. BRING THEM IN— It’s gonna get cold…eventually. Cold weather is a great time to start an interior project or two. You’ll be spending more time inside to escape the frigid weather, so might as well put the time to good use! Painting walls in a room or repainting woodwork are both great cold weather projects that don’t take too much time but offer a fantastic fresh update. SAY NO TO BEEPS – Nothing is more annoying than a chirping smoke detector, so before it begins give it a checkup. Test the batteries in your smoke detector and if needed, change them out. WINTERIZE—Make sure that all crawl space openings are closed to prevent cold air going under the house and straight to the pipes. Assuming you haven’t done this already, drain and disconnect your garden hoses and wrap/insulate all exterior pipes and install faucet covers to protect your spigots. GOOD OLE APPLIANCE TIME—Another great indoor project during cold weather is appliance maintenance. Gee…didn’t I make that sound fun? Seriously though, appliances don’t get cleaned as often as they should. Give your kitchen appliances a deep clean, including the refrigerator coils. Every model is different, so check your manufacturer instructions on how to do it. If you’ve lost the manual, google the make and model and you’ll likely find a free printable replacement manual. If your fridge has a water filter, check it to see if it’s time for a filter replacement. 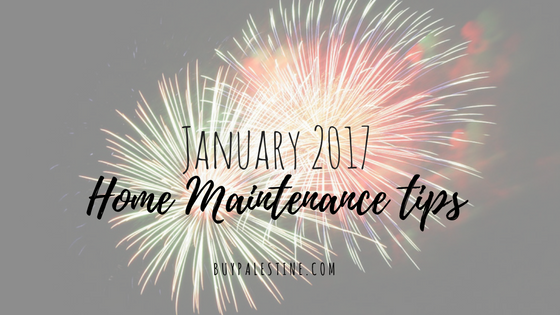 If your New Year’s resolution was to stay on top of your home maintenance tasks, don’t worry, I’ve got ya covered. Enjoy your bubbly and cheers to a fantastic 2017! Lisa E. Priest will take a month to get used to writing “2017” and is an East Texas Area Broker/REALTOR® with Picket Fence Realty, Inc. You can reach her via phone or text at 903-948-3343 or read more at BuyPalestine.com.